No More Rules…But the Beer Continues! …and then it dawned on me. Fishing. But not just any kind of fishing. Shark fishing! Think about it for a second, most times when the question is asked what you did for your bachelor party you usually get the response, “I don’t remember half the night. It was crazy!” First off, that’s not my style. Second, I wanted to have an epic tale to tell. And that I did. I also had to have a fitting beer to go along with the story. And that brings us to beer number 21, Great White from Lost Coast Brewery. Now you have a better idea of how excited we were leading to this adventure. Finally, the day was upon us and we boarded our boat. To be completely honest, I wasn’t so sure if we were even going to catch anything. I was optimistic, but I have had far too many boat trips where I came back empty handed. Thankfully, that wouldn’t be the case this time. It wasn’t long after we set three baits in the water that we were hooked up. After clearing the other two lines, I was handed the rod and the fight was on. I need to preface this with the fact that, while I’ve been fishing my whole life, I’ve never caught anything bigger than about four pounds. So this was a little of a shock to me. While receiving instruction during the fight, I quickly tired and almost tapped out. But after some quick motivational coaching by our great deck hand, Blake, I dug in and kept fighting. I have no clue how long the fight lasted but before I knew it, I had the shark up to color. Next thing I knew we were pulling it up over the side of the boat and I’m not sure I’ve ever smiled so big or shaken so hard. My left arm was shot after holding on to the rod and I would discover later that I had a huge blister and a bruise on my right hand. All worth it. I honestly could have called it a day but thankfully for us, we had at least five more hours of fishing ahead of us. Due to a combination of rough seas and sick anglers, the Captain decided it was best if we anchored off some kelp and did some bass fishing for the rest of the trip. Great idea. We ended up pulling in 30 bass between four anglers and that was only the ones we kept. I was getting bit on every cast and couldn’t believe how well we were doing. When it was all said and done, we pulled in the one thresher shark, a ton of calico bass, a few sand bass, a handful of mackeral and at the very end of the day, I caught a barracuda as the final catch (not a keeper). After the boat pulled in and unloaded us and our catch, we headed home for a celebratory beer. Obviously we picked Great White for the fact that it was shark related. But in the end, it was the perfect selection. Much like last week’s beer, Renegade Blonde Ale, Great White is best described as a crisp, refreshing lager that incorporates hints of citrus and even a little honey. I would love to tell you what it smelled like, I think I detected a citrus smell, but I wasn’t sure because my hands still reeked of anchovies, bass and shark! 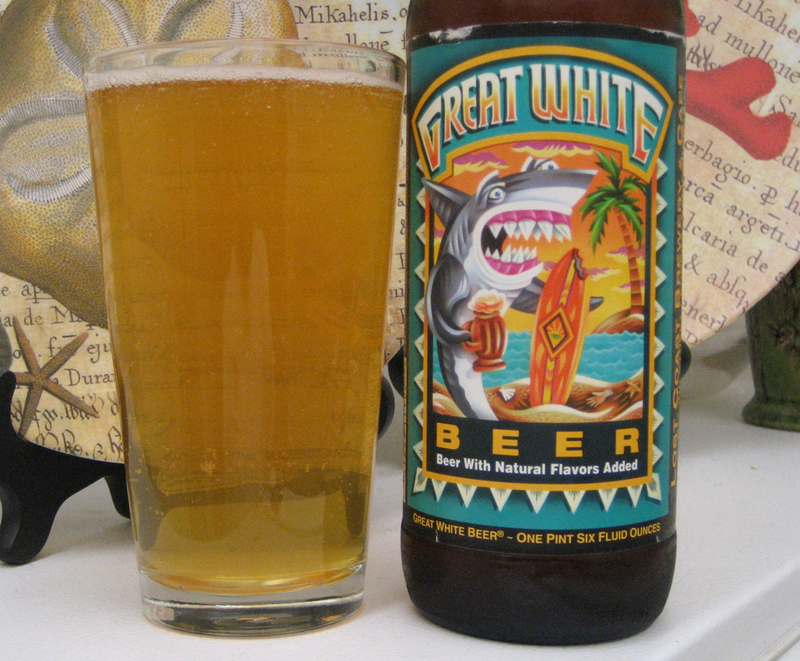 Great White is not an unfamiliar beer to me. I’ve always enjoyed its refreshing nature on a hot, summer day. I’m going to give it a “Thumb’s Up” because it’s a great beer that I savor and I’m going to enshrine it as one of “52’s Faves” because it will forever remind me of the first time I slayed a shark. Follow Fifty-Two Bottles on Facebook!